Last issue, David Seddon reviewed the recent political history of Niger, where President Mahamadou Issoufou had – as an exception to most African presidents – recently announced that he would not amend the constitution to allow him to seek a third term after his second and final mandate ends in 2021. In this issue, he considers the case of Togo, where popular protests broke out in August 2017 against President Faure Gnassingbé, whose father Etienne Eyadéma Gnassingbé, was (until his death in 2005) the longest serving president in Africa. Togo achieved independence from France in on 27 April 1960. In the first presidential elections in 1961, Sylvanus Olympio gained 100 per cent of the votes as the opposition boycotted the elections. On 9 April 1961 the Constitution of the Togolese Republic was adopted, according to which the supreme legislative body was the National Assembly of Togo. Olympio tried to reduce Togo’s dependence on France by establishing closer relations with the United States, Great Britain and Germany. In December 1961, several leading figures in the opposition were accused of plotting an anti-government coup. They were arrested and detained, and opposition parties were dissolved by decree. In January 1963, Olympio was assassinated by a group of soldiers under the direction of Sergeant Etienne Eyadéma Gnassingbé, and a state of emergency was declared. The military handed over power to an interim government led by Nicolas Grunitzky. In May 1963, Grunitzky was elected President of the Republic. The new leadership reversed Olympio’s foreign policy and pursued closer relations with France. Internally, his tried to reduce the differences and tensions between north and south, to promulgate a new constitution (1963) and introduce a multiparty system. Exactly four years later, on 13 January 1967, Eyadéma Gnassingbé overthrew Grunitzky in a bloodless coup and assumed the presidency. He created the Rally of the Togolese People party, banned the activities of all other political parties and formally introduced a one-party system in November 1969. He was re-elected in 1979 and 1986. In 1983, a privatization programme was launched and in 1991 – as in so many other African countries at the time – other political parties were allowed to operate again, but with considerable informal restrictions. Efforts at ‘economic reform’, undertaken with support from the World Bank and the IMF, led to private and public sector strikes, and popular protest throughout 1992 and 1993. The devaluation of the currency by 50 per cent in January 1994, designed to provide an important impetus to renewed structural adjustment, generated considerable political turmoil and economic development remained limited. This was, in part, because prices of Togo’s major exports – phosphates and agricultural commodities (coffee, cocoa, cotton and groundnuts) – remained relatively low over the next decade (depressed cocoa prices led to a 1 per cent drop in GDP in 1998), and in part because of the lack of electricity, as Togo produces only about a third of its needs and imports the remainder from Ghana and Nigeria, which constrained the development of the industrial sector, including cement production. Togo has the fourth largest phosphate deposits in the world, producing around 2 million tons per year (and generating 34 per cent of GDP in 2012). Since the mid-90s, however, there has been a decline in the mining industry and reduction in export earnings due to falling phosphate prices on world markets and increasing foreign competition. While export earnings are high relative to most other countries in Africa (owing to the exploitation of its phosphate deposits and its relatively developed agricultural export sector), the standard of living of most Togolese is not. The bulk of the population (65 per cent) remains rural and relies heavily on subsistence farming of crops like cassava, maize, millet and rice and on livestock production. Agriculture generated 28 per cent of GDP in 2012 and employed about half of the working population in 2010. Togo is one of the Least Developed Countries (LDCs) with an average per capita GDP of $491 (average for all LDCs is $1,436) and an economic vulnerability index of 33.6 (average for all LDCs is 41.4). Eyadema Gnassingbé died suddenly of a heart attack on 5 February 2005. At the time of his death, he was the longest-serving leader in modern African history, after having been president for 38 years. Under the Togolese Constitution, the President of the Parliament, Fambaré Ouattara Natchaba, should have become President of the country, pending a new presidential election to be called within sixty days. Natchaba was out of the country, returning on an Air France plane from Paris. The Togolese army (known as the Forces Armées Togolaises (FAT) or Togolese Armed Forces) closed the borders, forcing the plane to land in nearby Benin. With an artificially created power vacuum, the Togolese Parliament voted to remove the constitutional clause that would have required an election within sixty days, and declared that Eyadema’s son, Faure Gnassingbé, would inherit the presidency and hold office for the rest of his father’s term. Faure was sworn in on 7 February 2005, despite international criticism of the succession. The African Union described the takeover as a military coup d’état. There was also disapproval from the United Nations. Within Togo, opposition to the takeover took the form of uprisings in many cities and towns, mainly in the southern part of the country. In the town of Aného, a general civilian uprising followed by a large-scale massacre by government troops went largely unreported. It was estimated by some sources as many as 500 people died in the government crackdown against opposition protests. In response, Faure Gnassingbé agreed to hold elections and on 25 February, he resigned as president, but soon afterward accepted the nomination to run for the office. On 24 April 2005, he was elected President of Togo, receiving over 60 per cent of the vote according to official results. His main rival in the race had been Emmanuel Bob-Akitani from the Union des Forces du Changement (UFC) or Union of Forces for Change. Parliament designated Deputy President, Bonfoh Abbass, as interim president until the inauguration. On 3 May 2005, Faure Gnassingbé was sworn in as the new president. The European Union suspended aid to Togo in support of the opposition claims, unlike the African Union and the United States which declared the vote ‘reasonably fair’. The Nigerian president and Chair of the African Union (AU), Olusẹgun Ọbasanjọ, sought to negotiate between the incumbent government and the opposition to establish a coalition government, but Gnassinbgé rejected the AU Commission appointment of former Zambian president, Kenneth Kaunda, as special AU envoy to Togo. In June 2005, however, he nominated opposition leader Edem Kodjo as the prime minister. In October 2007, after several postponements, elections were eventually held under proportional representation. This allowed the less populated north to have as many MPs as the more populated south. The president-backed party Rally of the Togolese People (RPT) won an outright majority, with the UFC coming second and the other parties managing very limited representation. Again, vote rigging accusations were leveled at the RPT. Despite the presence of an EU observer mission, there were canceled ballots and illegal voting took place, mainly in RPT strongholds. The election was, however, declared fair by the international community and praised as ‘a model’, with little intimidation or violence, for the first time since a multiparty system was reinstated. On 3 December 2007, Komlan Mally of the RPT was appointed to prime minister succeeding Agboyibor. However, on 5 September 2008, after only 10 months in office, Mally resigned. Faure Gnassingbé won re-election in the March 2010 presidential election, taking 61% of the vote against Jean-Pierre Fabre from the UFC, who had been backed by an opposition coalition called FRAC (Republican Front for Change). Though the March 2010 election was largely peaceful, electoral observers noted ‘procedural errors’ and technical problems, and the opposition did not recognize the results claiming that irregularities had affected the outcome. Periodic protests followed the election. On 11 April 2010, for example, it was reported by All Africa that 4,000 opposition activists had taken to the streets of the capital, Lomé, to protest the re-election of Faure Gnassingbé in the March polls. The demonstrations, organised by the main opposition coalition Republican Front for Change (FRAC) and which had become weekly events, ended peacefully, and in May, long-time opposition leader Gilchrist Olympio announced that he would enter into a power-sharing deal with the government, a coalition arrangement which provides the UFC with eight ministerial posts. In June 2012, government electoral reforms prompted protesters supporting the coalition of opposition parties to take to the streets once again for several days. The protesters sought a return to the 1992 constitution that would re-establish presidential term limits and reverse changes made to voting rules. Dozens were arrested. A prominent opposition leader and former prime minister, Agbeyome Kodjo, who led some of the protests, was also briefly detained. On 14 July, security forces raided the home of one of the movement’s leaders, Jean Pierre Fabre, leader of the National Alliance for Change party (ANC). The officers fired teargas and injured some of the occupants. Four of the officers involved in the raid were formally reprimanded, according to the Ministry of Security, but Fabre’s ANC called on its supporters to protest: ‘the population needs to mobilise to defeat this regime, which does not respect the constitution and human rights’, Fabre told AFP. Following this, several thousands of anti-government demonstrators rallied in Togo’s capital to protest what they said was a crackdown on the opposition movement. The demonstration ended more or less peacefully. July 2012 also saw the surprise resignation of the prime minister, Gilbert Houngbo, and the rest of the government. Reuters reported that the president’s office had claimed that they resigned voluntarily ‘to broaden the leadership ahead of the next parliamentary elections’, which were to be held in October. According to an official statement issued by the president’s office, it was considered ‘important that all representative movements in Togo’s society are involved in public office in this new period in preparation for the parliamentary elections’. The statement, published by government daily newspaper Togo-Presse, added that the president would now hold talks with all those interested in joining the government. Days later, the commerce minister, Kwesi Ahoomey-Zunu, was named to lead the new government. Legislative polls were planned for October, but no date had been given yet, and opposition groups said more time was needed install measures to guarantee a clean vote. Opposition-led protests and strikes demanding electoral reform effectively delayed the process, and, after being rescheduled for 24 March 2013, the parliamentary elections were postponed again, first to 21 July 2013 and then to 25 July 2013. Some members of the opposition sought a postponement in order to see electoral reforms take effect prior to the elections, while others sought the repeal of the changes as improperly introduced. Amongst the latter was the controversial alleged gerrymandering of constituency borders to favour the ruling Union for the Republic (UNIR), led by President Faure Gnassingbé, and the 10-seat increase in the number of members of the National Assembly from 81 to 91. Although the government banned street demonstrations in commercial areas during the elections – which were eventually held on 25 July 2013 – citing an inability to maintain security and public order, protest organizers from opposition and civil society groups pledged to carry out protests and denounced what they termed an attempt to stifle criticism. In the event, the ruling Union for the Republic (UNIR) won 62 of the 91 seats in the new enlarged National Assembly in what was considered to be a landslide. The opposition Union of Forces for Change (UFC) suffered heavy losses (down to 3 seats from 27), and a new grouping, the Save Togo Collective, secured 19 seats to become the main opposition party in the National Assembly. Protests termed ‘Let’s Save Togo’ were planned for 21–23 August. 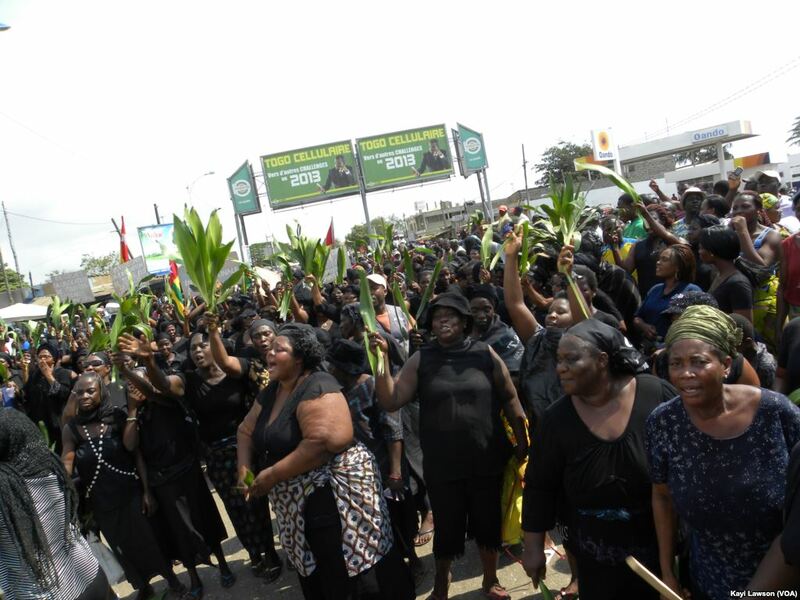 On the first day, several thousand protesters commenced a march in Lomé‘s Be neighbourhood and then headed to the commercial district of Deckon, where 100 police officers were deployed. There was then a dispute as to whether the protest march would end in Deckon for a rally or proceed further; eventually, the protesters were dispersed using tear gas 10 minutes after the march commenced. When the National Assembly began its new term at the beginning of September, Dama Dramani, a UNIR deputy, was elected as President of the National Assembly. Opposition MPs boycotted the vote as UNIR was unwilling to give them the posts of first and second vice-president in the Bureau of the National Assembly; consequently UNIR deputies were elected to all of the 11 posts in the Bureau – another landslide victory for the ruling party. On 25 April 2015, over 2 million Togolese took part in the third presidential election since the death of Eyadema Gnassingbé in 2005. The election was held in the face of considerable public opposition to a third term for the president. There had been more demonstrations demanding a return to the 1992 Constitution, which limited the presidential term of office to two only, and just before the elections, teachers and health care workers went on strike, demanding better pay and working conditions. Some of these were violently repressed, creating an ugly mood in the country. Some observers even considered it possible that Togo would go the same way as Burkina Faso, where the long-ruling Blair Compaoré had been forced to resign from office after protestors called for his departure in late 2014 (discussed in previous issues, nos. 2, 3 and 4 of this project). Initially scheduled for 15 April 2015, the election was postponed by ten days at the recommendation of John Dramani Mahama, President of Ghana and acting chair of the ECOWAS organization, given the tense situation. Provisional results by the National Independent Election Commission declared Gnassingbé the winner with about 59 per cent of the vote, whilst Fabre, the leader of the ANC and main opposition contender, received 35 per cent. Fabre called the results ‘a crime against national sovereignty’, saying he considered himself the new president. The UN, the African Union, ECOWAS and the National Consultation of Civil Society (a Togolese NGO funded by the European Union) pronounced the elections to have been free and transparent. On 3 May, the Constitutional Court validated the official results and proclaimed Gnassingbé president for the next five years. Fabre refused to file appeals to the Court, arguing that the institution was subservient to the ruling party. Gnassingbé was sworn in for his third term on 4 May 2015, thereby extending his tenure until at least 2020. Official reports put the turnout at 61 per cent of registered voters, which gave Gnassingbé a solid if not overwhelming victory. Things remained generally quiet until recently, in August 2017, when anti-government protests broke out in response to renewed calls for the introduction of presidential term limits. Faure Gnassingbé has now been head of state for over a decade, since 2005 when he took over from his father Gnassingbé Eyadema, who seized power in a coup in 1967, seven years after independence. The Gnassingbé dynasty has been in power for 50 years. Parliament voted recently in favour of a proposed change to the constitution to introduce a two-term limit ahead of the next presidential election in 2020. But the opposition boycotted the vote, claiming that the proposal was in fact a ruse by the government to make itself look reform-minded and at the same time allow President Gnassingbé to stay in power until 2030. A similar constitutional reform draft bill was rejected two years ago. Some opposition politicians want the president to step down immediately, and none of them want him to be able to stand in 2020. They say he is already in his third term, since he took over from his father in 2005 and was re-elected in 2010 and 2015, and want to revert to the 1992 Constitution which states that ‘under no circumstances may anyone serve more than two terms’. The opposition is now supported by the majority of the bishops, as well as by large numbers of protestors. Demonstrations have so far been largely peaceful – although there have been clashes with the police and a certain amount of street violence – but the scale has been unprecedented, with organisers claiming that as many as 800,000 people – out of a total population of about 7 million – took to the streets on 19 August 2017, all across the country and not just (as usual) in Lomé. This is what makes the current wave of protests different from before. For many years, the south of the country was seen as anti-government; but the Gnassingbé family drew all the support it needed from the north, where they come from. This time, however, some of the biggest demonstrations have taken place in cities like Sokodé in the centre-north (where two people were killed according to official sources and seven according to the opposition), and in Dapaong and Mango in the north. Also, a new opposition figurehead, Tikpi Atchadam, leader of the National Panafrican Party (PNP), hails from the north. The government responded to the popular unrest by cutting off all mobile 3G data to try and prevent people from using social media to mobilise. It also called for its own supporters to demonstrate. In addition, it accused Atchadam of links to Islamist radicals, but has not produced any evidence to support its allegations. This seems not to have been effective. On 7 September, Al Jazeera reported that ‘hundreds of thousands of opposition supporters have reportedly taken to the streets in several cities across Togo to call for constitutional reform, despite an apparent government concession to their demands. Aime Adi, head of Amnesty International in the West African country, told AFP news agency ‘at least 100,000’ were demonstrating in the capital, Lomé, with similar demonstrations taking place in some 10 other cities. For his part, opposition party leader Jean-Pierre Fabre had called the demonstrations ‘unprecedented’ and estimated (perhaps somewhat overenthusiastically) that ‘more than one million people’ were on the streets of Lomé. Al Jazeera noted that ‘the figures could not be independently verified by Al Jazeera’. On 12 September 2017, it was reported that the National Assembly had suspended its session for the summer break with opposition members objecting to the lack of any discussion on constitutional reforms, despite promises that this would be addressed. Opposition MPs want a discussion on re-instating the country’s 1992 Constitution – as has been demanded on several previous occasions, to no good effect. This would mean presidential terms limited to two, and two rounds of voting to enable the opposition to re-unite in the second round behind one candidate. Meanwhile, the popular protests continued, with reports of a number of people killed and more injured. On 20 September, Africa News reported that internet connection had been intermittent in Togo hours ahead of another planned demonstration over the following days for the reinstatement of the 1992 constitution. Bandwidth was reduced and WhatsApp was totally blocked across the country, creating difficulties in accessing the internet, according to Togolese journalist Emmanuel Agbenonwossi. In the meanwhile, protestors clashed with security forces in several towns, including the north. Reuters reported that a 9-year-old boy was shot in the head and killed in Mango, according to Francois Patuel, of Amnesty International, citing local sources including family members. This was confirmed by Security Minister, Damehame Yark, but he blamed the opposition and the protestors. There were also demonstrations in the northern city of Bafilo between protesters and Gnassingbé loyalists, injuring several, according to opposition leader Jean-Pierre Fabre at the end of a peaceful march in Lomé. The news, as of late September, was that President Gnassingbé had chaired a cabinet meeting which saw ministers approve plans for a bill about restrictions on terms in office and changes to the voting system. ‘This bill to modify the Constitution concerns specifically the limitations of mandates and voting procedures’, said the government statement, referring to article 59 of the Constitution. What is not clear, in particular, is whether the bill would be retrospective in effect, which would mean Gnassingbé could not stand in 2020, or would apply for the future, giving him the possibility of at least one more and possibly even two further terms of office. Featured Photograph: Demonstration in Lomé on 29 November, 2013. Thousands of protesters launched a ‘march of anger’ and processed through the streets of Lome, the capital of Togo, for the second day running – with banners saying ‘the Tologlese people say NO! 50 years is enough! – in a campaign aimed at forcing out President Faure Gnassingbe. The march culminated in a rally on the seafront. “Demonstrators have used rocks to block the road from Gakpoto to St. Joseph’s school, and others are preventing cars from going through,” Amnesty International’s director for Togo, Aime Adi, said. In Atikoume district, angry youths refused to follow the march itinerary set down by the 14-party opposition coalition, and said they would block streets, an AFP journalist saw. In some neighbourhoods on the march route, the tension that was noticeable on Wednesday seemed to have eased somewhat; but the marchers promised they would maintain pressure on the Gnassingbe government. “I am not tired and I will never be tired so long as the struggle is not over. Even if we have to march every day, I will be there,” said one protester. In the north of the country — a region previously seen as reliably pro-government — several other rallies, also drawing thousands of people, took place in the northern cities of Sokode, Bafilo and Dapaong, local residents told AFP. However, there were no protests in the far northern town of Mango, where a young man was killed in a demonstration on September 20, which was followed by a crackdown by the authorities. The protests are the seventh in a wave of agitation that began in August. At least four people have been killed and dozens injured. The government is proposing an overhaul of the constitution which would mean that, ‘in future’, presidential terms would be limited to two five-year spells in office. Gnassingbe, in power since the death of his father in 2005, was re-elected in 2010 and again in 2015, in votes that the opposition denounced as unfair. If the two-term limit applies from the next elections, scheduled in 2020, he could theoretically remain in office until 2030. According to a source close to the presidency, the proposed change to the constitution will be put to a referendum by the end of the year. It is unlikely that this proposal will be accepted by the opposition, and further popular protest at that time seems probable.